Our model, which will be implemented in two partner communities in 2019, requires the following inputs: mature cocoa land designated by the village as a communal farm, volunteer labor to maintain and harvest crops, and buy-in from the local community and school. All proposed interventions, including farming best practices and improvements in the education system, are developed and tested at our Tarkwa Breman Center of Excellence. Village Committees utilize revenue from communal cocoa land as funds for investing in improvements in local education systems. Based on lessons learned from the Center of Excellence, Cocoa 360 offers advice to Village Committees for their educational investments. The organization’s Monitoring & Evaluation team tracks progress on the community farm and in local schools for three years after beginning the partnership. 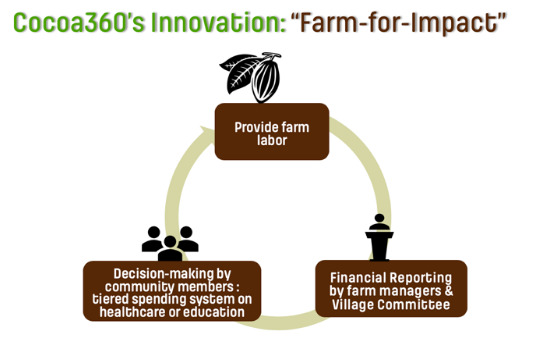 Cocoa360 can then intervene to provide support and guidance to its partner communities, where it is needed.